Gotta get some fuel in me, another 50 degree January day means I'll be getting out on the golf course! Oatmeal with raisins, strawberries, bananas and a little brown sugar (I only use about 1/3 of what they give). 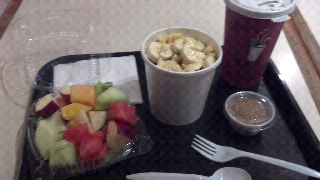 The fruit salad looked nice and fresh today too and of course gotta have my coffee!